In addition to the sculptures inspired by subjects which I am familiar with(cats and birds) or that interest me for the expression found in their forms (fruits, shells etc.) I welcome opportunities to work on commissions. Collaborations with art loving clients and architects provide a counterpoint to the creation of one’s self directed work. Projects have included individual sculptures as well as architectural sculpture for residential and commercial buildings. I have made commissioned portraits, sculptures of breed dogs and other animals, architectural friezes and other forms of architectural ornaments. The bronze pieces in this website are in editions of 9 or 20. Wall pieces are hollow casts made in hydrocal and fiberglass for indoor installation or hollow cement and fiberglass for outdoor installation. Also available are sculptures (dove sconces) made out of ceramic materials. Please email me or call to inquire about gallery referrals, availability, additional photographs and pricing. 1967–1968 Studied drawing with Francisco Zuñiga at the Escuela Nacional de Pintura y Escultura in Mexico City. 1975–1978 worked in Pietrasanta, Italy with an ITT Fellowship learning marble carving. I work in the tradition, as old as art itself, of observing and analyzing a subject and translating that information into clay or onto paper. This process enables me to have a spiritual connection with my predecessors from every part of the world who worked in the universal language of sculpted form. I am attracted to familiar subjects that present a variety of complex forms to discover, analyze and recreate. The subject is a source of visual information to be abstracted and manipulated like words, sounds and ideas in a poem. The process of scrutinizing a subject and mentally deconstructing it in order to build it in clay or on paper provides endless opportunities for discovery and expression. 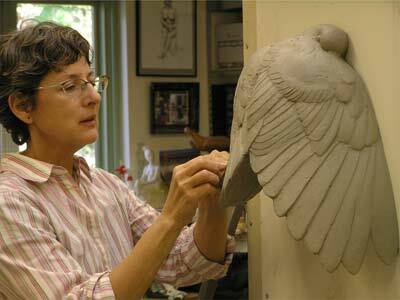 A solid foundation in clay modeling, marble carving and drawing has given me tools to investigate and experiment. The process needs to be flexible. An example of the way a process can enable expression is: to draw a three dimensional subject and then sculpt from that two dimensional drawing bringing the information back into three dimensions in order to add another layer of interpretation to the process. Sculpting consists of making a dynamic armature by finding the axes of geometric volumes, creating a three dimensional map, examining the way light reveals shapes, honing profiles, and manipulating the clay in layers so surfaces are integrated. Analyzing how you see as you juggle these elements leads to the evolution of visual intelligence which in turn leads to the capability of internalizing the language of form to express personal feelings and thoughts.